The original Nebula Mars was a big hit for Anker, giving people access to a high-quality projector and a high-quality sound system in one portable package. At $600 though, it’s far too expensive for many people. That’s why Anker came up with a new updated version that offers almost as much oomph for a lower price, and you can shave an extra $100 off that reduced price tag today with a special code. 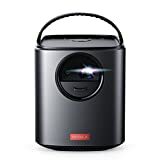 The Nebula by Anker Mars II 300 ANSI lm Portable Projector can be had right now for just $399.99 if you use the coupon code NEBULA10 at checkout. It’s worth every penny at its full price of $500, so definitely don’t miss this deal. HD Picture: 720p definition, a 300 ANSI lm brightness, and DLP IntelliBright technology combine to provide a crisp, clear picture. Stunning Sound: Dual 10W audio drivers deliver deep bass and cinematic stereo sound. Single-Second Autofocus: Set it down at any distance and angle and get a focused picture in 1 second. Android 7.1: Run streaming and media apps flawlessly. Seamlessly display content from Netflix, Youtube, and more for endless entertainment. NOTE: Copyrighted content from Hulu, Netflix, and similar services CAN NOT be mirrored or screencast. Download and use the apps directly through Mars II to view copyrighted content from these providers. Chromecast is not supported.